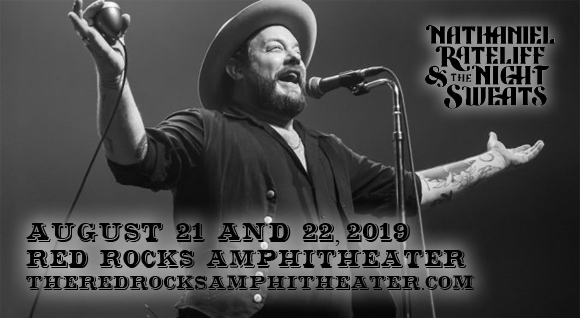 Red Rocks favorites Nathaniel Rateliff and The Night Sweats are coming home to Red Rocks Amphitheater on Thursday 22nd August 2019! The tireless folk rock powerhouse band are known for their full-power live sets that team gritty blues with joyful Americana, creating a dizzying blend that that feeds the soul! Get ready to be moved both in body and mind by this supremely talented eight-piece! Declared by the New York Times to be a “Denver local folk-pop hero” at the beginning of his career, American singer and songwriter Nathaniel Ratecliff began to make a name for himself in the Denver scene as part of the rock outfit Born in the Flood, which he formed in 2002. After releasing Born in the Flood's first full-length album If This Thing Should Spill in 2007, Ratecliff turned down an offer from Roadrunner Records and chose to concentrate on his more sober and minimalistic acoustic solo act, Nathaniel Ratecliff and the Wheel. The solo act soon evolved into a full band, releasing the album Nathaniel Rateliff and the Wheel: Desire and Dissolving Men on Rounder Records in 2007. After Born in the Flood disbanded in 2010, Ratecliff released his debut solo album Desire and Dissolving Men on Public Service Records, followed by In Memory of Loss on Rounder Records. In 2013, he formed Nathaniel Rateliff & the Night Sweats with longtime collaborator Joseph Pope III and several other musicians – an upbeat, gospel-influenced Americana act. The band released its self-titled debut in 2015, followed by 2018's Tearing at the Seams.